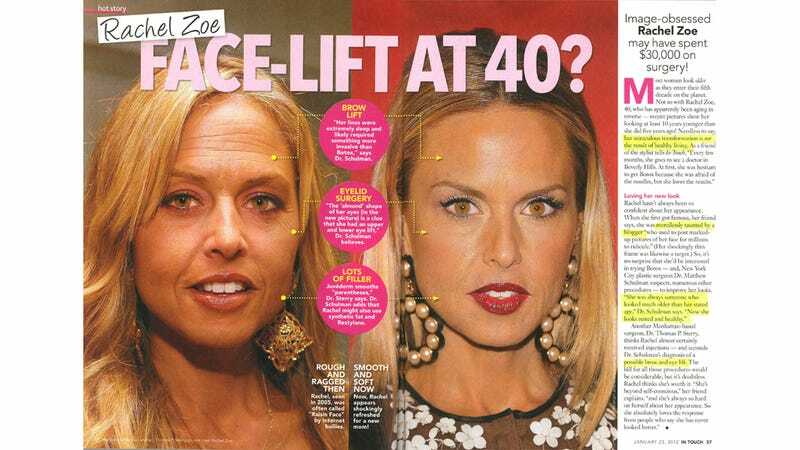 Rachel Zoe's Facelift Is Really Well Done. Did Rachel Zoe spend $30,000 on plastic surgery? The folks at In Touch think so, and as we all know, In Touch is, indisputably, a fount of facts. This week's issue features side-by-side photographs of Rachel in 2005 and today — and some lines and wrinkles have magically disappeared since then! The copy reads, "her miraculous transformation is not the result of healthy living." Ouch. Apparently RZ used to be "mercilessly taunted by a blogger," the most evil kind of taunter, and decided to try Botox. And some completely random doctors who have not treated Ms. Zoe think she may have have "a possible brow and eye lift." She had deep lines in her forehead which are no longer visible, and her eyes have an almond shape now, which Dr. So-and-so says "is a clue that she had an upper and lower eye lift." Yes, the lighting in the older picture is pretty horrid, but we looked through some photo archives from 2005 and the photo in In Touch doesn't seem to be a drastic misrepresentation (though it certainly is unflattering). But here's the thing: Unlike some other Hollywoodland folks who shall remain nameless, Zoe doesn't look like a plastic doll, or like she's wearing a mask. She's neither a gruesome shadow of her former self nor a fish-lipped gelfling; some completely normal signs of aging (gasp) are left untouched. She looks good; really natural! And so, if she did indeed have some stuff lifted, as this publication alleges, we applaud the surgeon: Well done. As if Ms. Zoe would expect anything less than impeccable work.